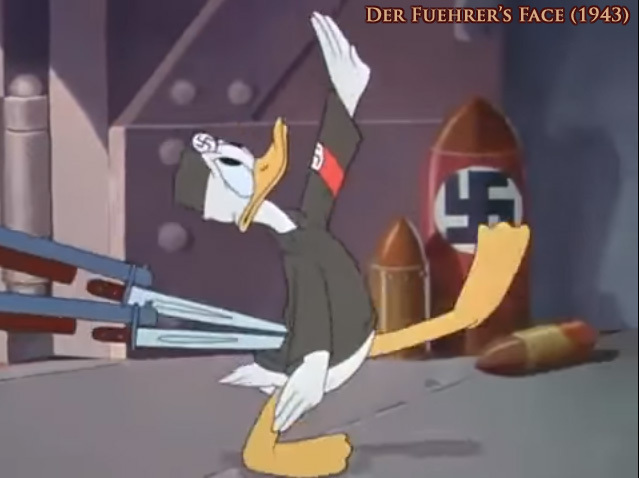 The two most substantive pieces of evidence to support the idea of Walt's supposed Nazism (in general, not just from the sources in the previous section) are a claim by animator Art Babbitt that he saw Walt Disney and his lawyer Gunther Lessing at a meeting of the German American Bund (an American pro-Nazi organization) which Babbitt himself attended out of curiosity in the late 1930's, and that German filmmaker Leni Riefenstahl visited the Walt Disney Studios on December 8, 1938 when she was in America to promote her movie Olympia (1938), having to do with the 1936 Summer Olympics which had been held in Berlin. we heil! Heil! and work into our graves." The thing with the claim of Walt attending Bund meetings is that it simply isn't sufficiently substantiated to accept that it even happened. The only evidence for it comes from a claim by Art Babbitt, which in this instance is a questionable source to say the least. Art Babbitt was one of Disney's top animators who nevertheless became his bitter enemy over union disagreements (to the point where there would have been an actual fistfight between the two in the studio parking lot had they not been restrained). The result was that these two men held a life-long grudge against each other and either one would gladly have taking the other down. As such a claim like this should really be taken with a grain of salt. Even in the late thirties Walt Disney had already established himself and was a well-known celebrity. How odd is it then that the only source who saw Walt and conveniently his lawyer at these meetings was a person who both hated him and who would gain (if only vengeance) from having Walt's reputation tarnished? So while I in no way wish to sully Art Babbitt's name instead, it seems much more likely that in this case Babbitt was either mistaken or simply lied. Without any counter-statement from Walt himself, if he even did attend those meetings, it is also impossible to determine his motives for attending. It is speculated that if he did attend these meetings, it would more likely be to facilitate the distribution of Disney movies in Germany rather than any admiration for Adolf Hitler. Disney historian Jim Korkis further notes that there was no indication of him attending such meetings in his office appointment book. The issue is even further complicated by speculation that Gunther Lessing, Walt Disney's lawyer who he supposedly attended these meetings with, was himself Jewish as suggested by Disney animator Ward Kimball in a 1986 interview with Michael Barrier. Which, if true, would not only raise even more doubts about their attendance of Bund meetings, but would also further complicate attempts to accuse Walt of being antisemitic. The previously mentioned article from Paste Magazine that brought up these claims links the Babbitt quote to Peter Fotis Kapnistos' Hitler's Doubles. A quick glance at the source reveals that this book (or at the very least this Disney-specific chapter) is just another amalgamation of more speculation and wild conspiracy theories. 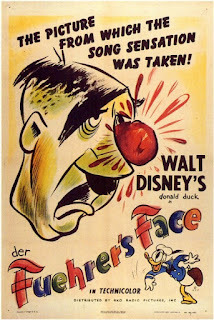 It includes a claim that Der Fuehrer's Face (1943), an anti-Nazi propaganda cartoon sponsored by the US government which mocks Nazi Germany by reducing it to a hellish-yet-ridiculous slapstick comedy, actually is about Donald Duck as a "good-natured trusty Nazi" (p.253) (rather than an impoverished worker drone going insane from having to work 48 hours a day) and him waking up from losing his mind in Hitler's factory to hug the Statue of Liberty is actually subliminal messaging of a loyal Nazi being committed to America. Most telling of all is that this book actually proposes the possibility that Walt Disney was really the alter ego of Adolf Hitler himself! (2) That's an impressive double life to say the least and just another example of how eager conspiracy theories surrounding the man are concocted. Since Hitler's Doubles was first released in 2015, it is impossible for it to be the original source however. Neal Gabler's 2006 biography of Walt Disney (which is even quote-mined in Kapnistos' book, conveniently reprinting the accusations but not the refutations that followed them) already mentioned the Art Babbitt quote and concluded Walt's attendance at Bund meetings was unlikely because at the time he was both too busy with his studio (this was when he had gained increased prominence with Snow White and the Seven Dwarfs (1937), which prompted him to make even better feature films to maintain his status as the number one in animation while he was also overseeing construction of the new Burbank studio) as well as his reputation for being politically uninterested at that time. 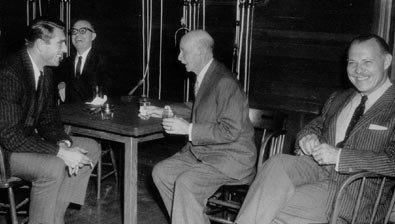 "[...] Art Babbitt in later years claimed to have actually seen Walt and Gunter Lessing at Bund Meetings of Nazi sympathizers that Babbitt himself had attended out of curiosity; that was highly unlikely, not only because Walt had little enough time for his family, much less political meetings, but because he had no real political leanings at the time." The source (or at least one of) for the claim of Disney's German American Bund attendances are pages 119-120 of the infamous Hollywood's Dark Prince (1993) by Marc Eliot, after an interview of Babbitt by Eliot in 1990. While Marc Eliot jumps to ridiculous conclusions (3) and is eager to speculate on Disney's nefarious motivations, I see no reason to believe his quotation of Arthur Babbitt is inaccurate. However even Eliot admits that if these meetings happened, they were more likely inspired by Disney's desire to distribute his movies to Nazi-occupied countries where they were banned. Furthermore as Babbitt was helping Eliot paint the negative picture of Walt Disney that he so desired for his book, Eliot doesn't question whether Babbitt's recollection is accurate or not. We once again turn to the Paste Magazine article. This time its source for Leni Riefenstahl's visit is the introduction of a 2011 New York Times article about Lars von Trier announcing himself to be a Nazi which for some reasons draws a comparison to the meeting of Walt Disney and Leni Riefenstahl, which the Paste Magazine author then reworded for his own article. Unlike Paste Magazine, The New York Times article at least had the decency to mention Walt turned down a showing of Riefenstahl's movie due to his apprehensions of playing host to her in the first place. Neither article mentions Walt later did disavow the visit, claiming ignorance of who she was (I haven't found whether this was feigned ignorance to her as a person or actual ignorance as to her political leanings). Instead the articles cite Steven Bach's biography "Leni" where she praises Walt hosting her as not having been taken in by Jew smear campaigns, which is hardly relevant to Walt's feelings or intentions regarding the meeting. Paste Magazine, with the benefit of 80 years worth of hindsight vs Walt Disney's pre-World War II political naïvité, just calls the visit "inexcusable". Leni Riefenstahl did visit the Walt Disney Studios on December 8, 1938 according to Gabler through an invitation from mutual acquaintance Jay Stowitts, who wrote Walt that Riefenstahl was interested in meeting who she considered "the greatest personage in American films". Of course the truth is that the visit is not at all a barometer for Walt Disney's own political leanings or which dictatorial regime he was supposedly involved with. Leni Riefenstahl was an influential and innovative filmmaker who receives worldwide acclaim even today, despite the now obvious fact that she had lent her talents to further the ambitions of an undeniably evil man with for example her Nazi propaganda movie Triumph of the Will (1935). Walt Disney had just enhanced his own status as a filmmaker with Snow White and the Seven Dwarfs (1937) and wanted to remain at the top of his field by making even more and better animated feature films. Thus Walt's interest in meeting her (publicly at his studio even. According to Gabler, Walt's desk diary indicated they watched a sweatbox session of a Fantasia sequence) would be much more likely fueled by her reputation as a film director rather than any sort of conspiratorial association with Adolf Hitler. Walt Disney was known for meeting artists of any kind at his studio and it seems much more likely he just didn't much care about Riefenstahl's politics because he was interested in the artist. "Leni Riefenstahl did visit the Disney studio, I gather, but so did Sergei Eisenstein, and no one has ever suggested that Walt was a Communist." So the most substantive fact that even remotely links Walt Disney to Adolf Hitler is nothing more malicious than two celebrated filmmakers having once met each other publicly. Everything beyond that is conspiracy theory based on unwarranted conclusions fueled with guilt by association. Twitter often doesn't require a lot of 'evidence' to get the rumor mill running. Occasionally someone just posts the following picture of Donald Duck apparently reading Mein Kampf, or a similar scene in which Donald is dressed in a Nazi uniform, to prove Walt Disney had pro-Nazi leanings. The context that is removed, and that anyone evidently hardly bothers to find out, is that this is a still image from the aforementioned Der Fuehrer's Face (1943), an explicitly anti-Nazi propaganda film and scathing satire of Nazi Germany meant to help sell savings bonds for the war effort. 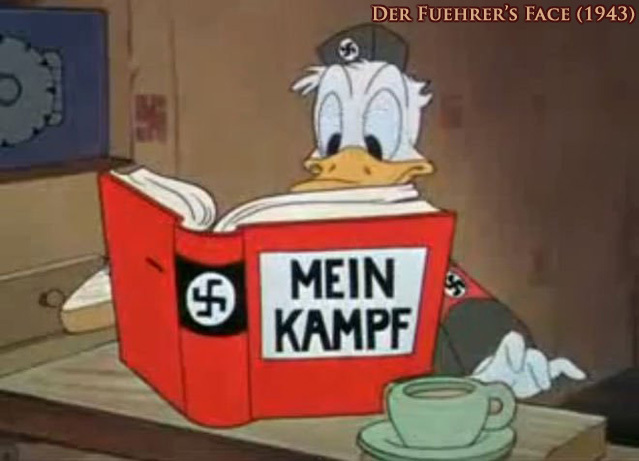 The short depicts Donald Duck as a factory worker in Nazi Germany (or Nutzi Land), where his clothes are made from paper and his breakfast consists of 'Scent of Bacon and Eggs', a piece of wooden bread so hard he has to cut it with a saw and water dipped with a single coffee bean (a luxury considering he attempts to keep it secret). His breakfast is interrupted by a copy of Mein Kampf being bayoneted in front of him. He is then escorted to the factory where it is his glorious privilege to work 48 hours a day into insanity making shells for the war. The task is being made even more annoying by random picture frames of Adolf Hitler being put in front of him, which he has to salute every time or risk getting a bayonet up his tail. 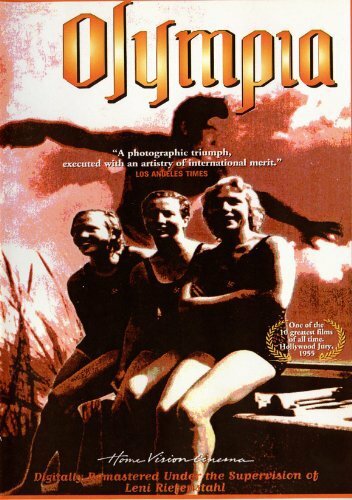 Meanwhile the overly optimistic soundtrack consists of lyrics superficially praising Hitler while the feigned optimism often breaks and reveals the singer's desire to get out of there, even dreaming of one of their artillery shells blowing Hitler to hell. The plentiful use of 'HEIL!' is also mocked by equating it to blowing a raspberry in Hitler's face (back then it was considered an extremely obscene gesture rather than merely crude). After Donald has a complete breakdown it is revealed he was merely having a nightmare and he wakes up in his bed in the United States of America, being glad he's a citizen. 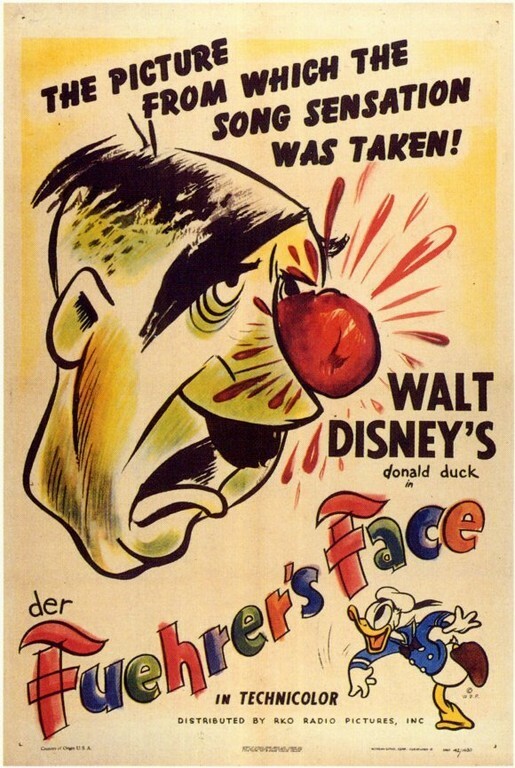 The short ends with a caricature of Adolf Hitler getting a tomato in his face, as he has in the promotional posters. So essentially whenever someone tries to assert Disney's Nazi allegiances by asking if they need to show you the Donald-Duck-is-a-Nazi cartoon, the appropriate response is to ask them if they themselves have actually watched it (it's not too hard to find on YouTube). However we're not done with World War II. Walt Disney Productions had a much larger contribution to the war effort than just a single anti-Hitler propaganda cartoon, which I'll cover in the next section. To sum this part up: Walt Disney is considered a Nazi sympathizer because of a rumor spread by an enemy (and backed up by nobody else), him once having met another influential filmmaker who happened to be a Nazi sympathizer (but never having been convicted for war crimes or even as a Nazi herself) but later having denounced the meeting anyway, and his own anti-Nazi propaganda getting taken horribly out of context. There's no record of him promoting Nazism, no record of him subscribing to their ideas. The only statements he made on Adolf Hitler before the war at worst reveal him not taking the threat of Hitler's regime all that seriously yet (I'm also not sure why he should have, he was a filmmaker, not an army general), on which pinning him down is an extremely low and petty blow, especially coming from people judging him with the privilege of perfect hindsight. Furthermore the US military would have screened him during his time as their own anti-Nazi propagandist and evidently they didn't think he was a Nazi sympathizer either. So there simply isn't evidence to suggest he was a Nazi, a Nazi sympathizer or a fan of Adolf Hitler. 1. The FactFile video shows this picture while talking about Walt Disney and Gunther Lessing supposedly attending these German American Bund meetings, which might intentionally or not implant the idea it is a picture from one of these meetings. However the source indicates it was taken at Gunther Lessing's retirement party in 1964, which is consistent with Lessing's advanced age in the picture. 2. Someone really needs to combine this theory with Marc Eliot's Hollywood's Dark Prince because that would make Adolf Hitler an illegitimate Spanish boy named José Guirao who was also a decades-long domestic spy for J. Edgar Hoover. 3. [See also Note 2] Chapter 11: The Mojacar Connection of Marc Eliot's Hollywood's Dark Prince speculates that because Walt Disney has no birth certificate, but an earlier birth certificate on December 30, 1891 exists with his name (actually the birth certificate of Raymond Arnold Disney), that there was a cover-up and Walt Disney was actually a Spanish man named José Guirao born 11 years before his actual birth to a Spanish couple in Mojacar, but the evidence for this has been destroyed (or planted for a cover-up on top of a cover-up) by Walt Disney Studio secret agents. Then in the notes section Eliot explains his source for all this is from a trip to Mojacar, Spain where he talked to some of the locals.